Green chillies 2 to 3 nos. Cook 1\2 Thur dal in a pressure cooker for 4 whistles, and keep aside. 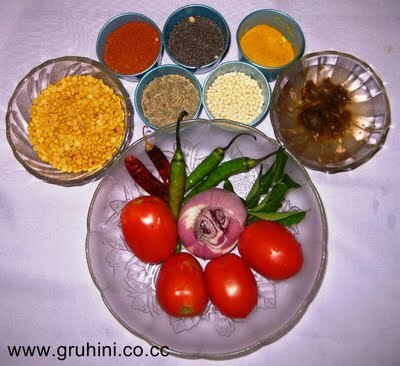 Take chopped tomatoes, onions and green chillies in a vessel and add salt, chilli powder, dhaniya powder and haldi . Add 1 cup water to it, boil until tomatoes are cooked. 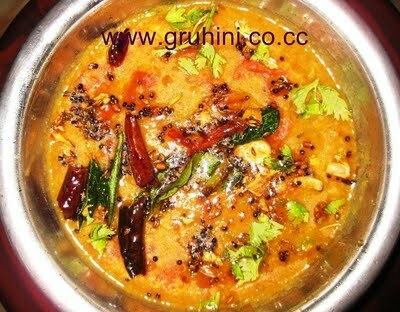 Add the boiled Thur dal , and 1 table spoon tamarind pulp to it and boil for 4 to 5 min. 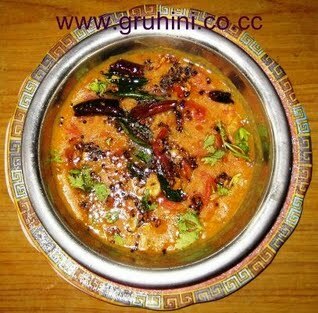 Heat 1 table spoon oil in a pan and add rai, jeera, urad dal, red chillies, garlic cloves and curry leaves and fry until golden brown and add the thadka to the dal. Take it into a serving bowl and garnish with dhaniya leaves.